Cartier’s history starts in 1900 with the first men’s wristwatch, the Santos de Cartier, made for the aviator Santos-Dumont. The Cartier brand subsequently became an icon of women’s watches, for their small size, perfectly suited for the female wrist, and the elegant yet never predictable shapes, often very distant from the prevailing circle geometry applied to watches. The unparalleled taste was matched by the product’s quality. The Cartier Watchmaker’s, located among the Jura Mountains, brought together every aspect of watchmaking expertise: 175 different crafts were included in the three divisions given over to development, production and customer services. At its premises, the Atelier Tradition guarantees to repair any Cartier watch regardless of its condition or age, using its understanding of the craft and traditional watchmaker’s tools. Cartier watches stand out for both their unique style and a series of emblematic features: the blue cabochon set in the crowns, the blue steel hands, the Roman numerals and the minute markings reminiscent of railroad tracks (in French “chemin de fer”). A further element is the secret signature that was conceived at the beginning of the 20th century to discourage and hinder any attempts at forgeries; this signature is hidden in one of the twelve roman numerals on the dial. The history of the Santos watch stems from a friendship and an incredible invention. In 1904 the famous Brazilian aviator Alberto Santos Dumon commissioned a watch from his friend Louis Cartier that had to be different to those one puts in one’s pockets so he could read the time while in flight. This led to the creation of the first men’s watch to be worn on the wrist. The geometric shape and the visible screws are the most significant features of what was soon to become an icon. The iconic Cartier watch, the Panthère is a timepiece the style of which is both unmatched and out of the ordinary. Panthère de Cartier embodies all the aesthetic features that are typical of the Maison’s production: the wrist is wrapped in a comfy small-link bracelet, the geometric shapes are softened by the rounded corners, the square shaped case contains the quadrant with Roman numerals, the octagonal-shaped crown is enhanced by a sapphire. In 1917 Louis Cartier defied conventions, by revisiting the watches’ design and including a system of integrated clasps on the case. And he replaced the typical round shape of traditional watchmaking with the square he much preferred. This is how the Tank came to be. The Calibre watch by Cartier favours powerful lines and shapes that catch the eye, by adding toughness and refinement to the traditional round watch. The timepiece runs on the automatic 1904 MC movement made by the Cartier Manufacture. 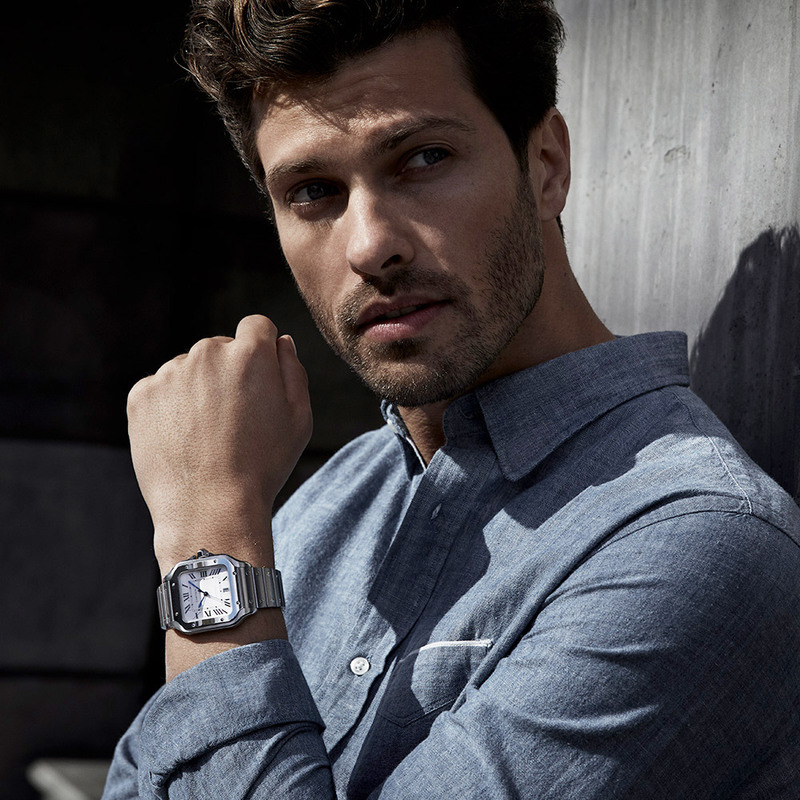 The Drive de Cartier watch is undoubtedly a men’s modern fashion statement. Its cushion shape underlined by the tense curves, highlights the timepieces’ elegant and refined design. With its Ballon de Cartier, the Maison revives in a very unusual way the typically round shape of most traditional watches. Cartier imagines a shapely case that inside flaunts a winding crown decorated with a blue cabochon. A clock has an internal mechanism that is made up of many cogs that are constantly moving and coming into contact. That’s why Cartier suggest that every watch should be checked every 4-5 years, partly to guarantee the reliability of the watch and verify the conditions in which it has been used. In this way one can assess the need for a thorough servicing to clean the mechanism of any lubricant oils, which over the years are naturally bound to lose their effectiveness, ensure that the case is still watertight and that the watch is in top working condition. For battery change operations, Cartier recommends contacting an authorized Servicing Centre that will have the equipment and tools required to carry out the operation and is certified to operate according to professional standards. For all watches, but in especially those that come into contact with water,Cartier recommends checking that the case is still watertight every year. One can ask for a free wet test to confirm water tightness from the Hausmann & Co. Servicing Centre.